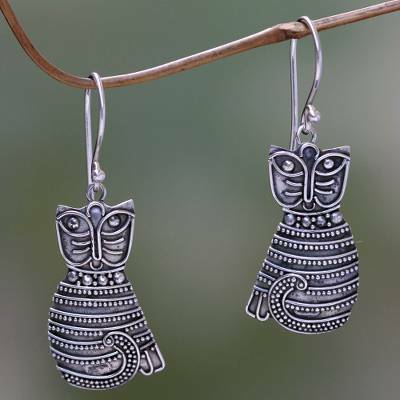 Fashioned of sterling silver, whiskery tabby cats are transformed into earrings. Sukartini crafts the original design, sharing her own knowledge of the feline psyche. You can find sterling silver dangle earrings 'Balinese Cat' by Sukartini in jewelry categories such as Animal Themed Earrings, No Stone Earrings, Silver Earrings, Sterling Silver Earrings and Dangle Earrings. Enjoy exploring these sections for other Novica treasures. Sukartini has seen two of her children graduate and continues to pay for the education of her youngest son. Sukartini has received 10 microcredit loans with 0% interest from Kiva and Novica, the first for $1500 and the most recent for $4000. Proceeds were used to stock up on the materials she needs for production, such as sterling silver and gemstones. Sukartini provides work for several local silversmiths. I love the style of these earrings, they are so cute! Very well made and of course come with a cool jewelry bag. Perfect for any feline fans! "Today I work together with local silversmiths to promote Bali's beauty in our own way." "Nyoman Sukartini is the full name given me by my parents when I was born. From the time I was little, my mother taught me how to be a 'Balinese woman.' In her mind, a Balinese woman must devote her life to God, her husband and also to society. She taught me how to cook and do housework and also how to make offerings, starting from very simple ones and continuing with the complex offerings, because almost every day is a ceremonial occasion in Bali. "At the age of 16, I studied at SMIK (Sekolah Menengah Industri Kerajinan) in Gianyar. In this school, I learned batik, ceramics and other home industries for three years. Back from school, I took an apprenticeship with a silversmith in a village where they specialized in jewelry. "Today I work together with local silversmiths to promote Bali's beauty in our own way. We make different kinds of jewelry, mostly with sterling silver, in both traditional and modern styles. I was fortunate to find Novica, a place where small artisans like me can share our new ideas and designs, and have a chance to be appreciated by people from all over the world." These are really cute and are well made. I would have paid more for some a bit larger, however. It would be nice to have the option.